Cheap shortcuts always lead to expensive consequences and this is the case when it comes to car washing. It is easy to assume that cleaning a car exterior is just about washing away the dirt, grime, and grease. That’s why we grab the remnants of dishwashing soap and splash on our vehicles. And from a distance, our automobile seems clean but that’s at best an optical illusion. The fact is that household dishwashing detergents and third-rate cleansers are ruining your car finish that not only degrades your class but also proves costly to remedy. Getting the best car wash will wipe out all the elements from your car surface and condition your car wax and paint for a head-turning shine that lasts as long as you own the vehicle. Coming after the review is a thorough application and buyer’s guide for the best soap to wash your car. Ditch that deteriorative dishwashing soap and get Meguiar’s non-detergent car wash that excellently glides grime and dirt from your car without grinding the car paint. Meguiar’s G7164 is a rich and luxurious auto cleaner that both washes and conditions your car paint. It is made of the finest and premium ingredients blended to foam away rigid dirt, grease, road grime, and other contaminants without stripping the wax protection. Meguiar’s best rated car wash soap also combines ultra-premium paint conditioners that clear away all the debris, to reveal your car’s color and purity, leaving a radiant looking finish. We love the fact that the ingredients and conditioners are biodegradable, thus safe for you and your vehicle no matter the type of paint. They will also not compromise the wax protection. The car shampoo has one of the strongest concentrations of foaming ingredients such that 1 Oz. is enough for a gallon of water. This is more than enough for a mid-size car, meaning that the 64 Oz. bottle can last up to or more than half a year. With the affordable price and long lasting capability, you will surely love this product’s convenience just like millions of professional auto detailers. The car shampoo conditioner is a non-detergent and is pH balanced such that it does no harm to the wax or clear coat, leaving your car with a clear and shiny finish. The top rated car wash soap is made of the world’s highest concentration of citrus shampoo and gloss enhancer. You only need one cap full to mix with 5 gallons of water to deliver the purest and clean vehicle surface that outshines other cleaners. The citrus-based hyper concentrated car wash and gloss effectively combines surface preparatory paintwork cleaner, shampoo, and a gloss enhancer. It is a 100% biodegradable formula that is paint surface friendly and safe unlike the hazardous solvent shampoos and cleaners that all are around. The citrus boosted lubricating foam is fast penetrating and it lifts and suspends soil and grime for easy scratch less rinsing. The natural citrus extract lubricates the paint surface allowing the only the dirt and debris to be washed off. Chemical Guys is the best soap for foam cannon as it creates luscious foaming suds with any foam gun or foam cannon. The thick lather bubbles help minimize the swirl marks and scratches produced by other run off the mill car wash soaps and towels. They do this by dislodging each dirt particle from its hideout so that you can easily rinse it for a clean spotless shine. Besides zero harm to paint and wax protection, the all-natural citrus cleaner is biodegradable and safe for the environment. You are therefore taking care of your car as you care for Mother Nature with a product free from artificial additives, colors and thickeners but still delivers a clean sparkling sheen. Let nobody cheat you that a car washer is just about foam and bubbles. The wrong soap-dish washing soaps and detergents, cheap car washes- will ruin both your car paint and wax. The pH should match your car wax; otherwise, it will corrode the wax and access the paint. Mothers California soap for car wash has a carefully balanced pH for this crucial safety and you can even use it on daily basis without dulling paint. It is made of a super foamy formula that is powerful enough to cart away all the dirt, grime, bugs, road film, tree sap, bird droppings, and airborne haze and pollutants, without peeling off the wax or paint or leaving swirl marks. It also prevents water spotting. Regularly cleaning your car with this soap cleanser will extend the life of your car’s paint and finish while giving the vehicle a stunning look for a long time. Optimum No Rinse Wash & Shine is a premium car wash soap and gloss, the number one choice by professional detailers and enthusiasts alike, for the fastest and cleanest results. If you don’t like rising your car after washing and then it takes ages to dry, get Optimum wash soap. The best soap to wash car is made of a formula that exclusively blends high lubricating polymers which bind with the car paint while washing off the dirt and grime. The polymers encapsulate the dirt and grime particles so that they don’t scratch the surface when wiping, leaving a clean and unblemished finish. Using this car exterior cleaner is also very cost effective and you can wash your car anytime, anywhere. To apply the no scrub car wash soap on your car exterior, you don’t need to spray it off with water from a hosepipe. You only need to wipe it with a microfiber towel or chamois soaked with the sudsy solution and all the dirt will transfer to the towel. This means that the two bucket method suffices, thus saving on time and water usage. In fact, the ratio is 1 ounce of the product per 2 gallons of water and this is more enough for a normal personal car. The fact that the no spraying and rising with hose pipe water is needed also means that you can clean your car in your garage or any other enclosed place, in a chilly weather and so on, without the need for a hot sun to dry it. Needless to say, the hot sun bakes the suds into the car paint, forming swirl marks and scratches. Finally, Optimum car soap wash is effective and safe for all types of cars, trucks, RVs, ORVs, motorbikes, boats and even aircraft. To know how to handle that stubborn tar on your car that won’t come out even after normal washing, click the link to see our other article on the best tar remover for cars. Leave dish wash formulas to cutlery and tableware, as it wreaks awful havoc to your auto finish. Instead, get Griot’s car wash that leaves your car with a brilliant finish, bucket after bucket. Griot’s Garage car wash is made of concentrated premium ingredients that erupt into rich, slippery suds that lift off dirt and grime so that they are washed away without affecting wax and paint. The thick foam lasts long enough to clear all the dirt while lubricating your car surface. It also works well with foam cannon, foam gun or pressure washer. The super high concentration means you only need 1 ounce per gallon of water, and that will be more than enough for your machine. The car wash formula is also pH balanced so that you can wash your vehicle exterior with the confidence that it will leave a clean finish without corroding or peeling wax and sealants. Special brighteners maintain your car paint with a high-gloss and streak-free shine that gets heads turning year after year. Finally, to assure your satisfaction, the car cleaner comes with a lifetime replacement or refund guarantee. For the perfect care of your vehicle windshields, you need a non-abrasive and fast acting formula that won’t react with glass micro-structure. 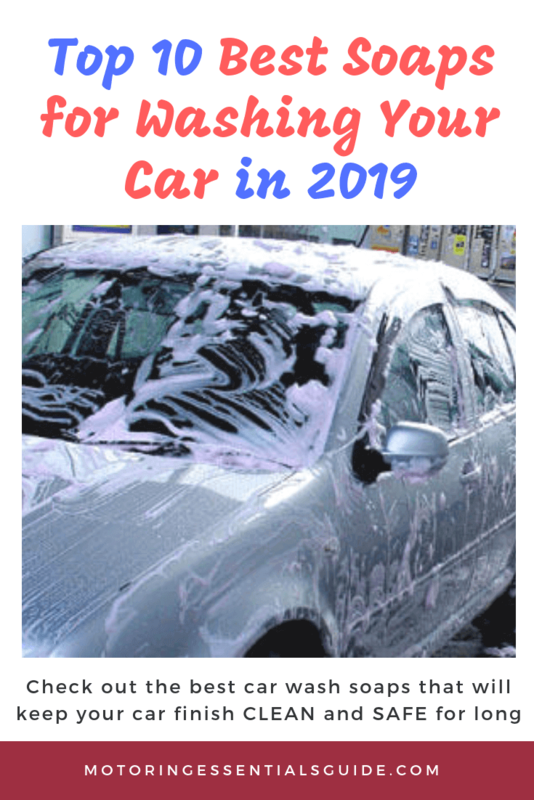 Click to see our review of the best window cleaner for cars in 2019. 6. Armor All 25464 Car Wash – 64 fl. oz. Your car’s finish is too delicate and precious to entrust dish wash soaps and just any other detergent. You need a powerful cleaner such as Armor All Car Wash that will wash away the toughest dirt, road grime, and bugs in a jiffy while preserving your car’s finish. If you are an off-road enthusiast, you can feel the annoyance of flying bugs that get stuck to your car hood, grill, and bumper as your drive on country roads. There are still other sticky elements such as tree saps, bird droppings, dust and sand, fumes etc that litter these and other car exterior areas. They are all sticky, ugly and you feel like you can scratch them off with a sandpaper. Of course, forgetting to mind your precious car finish. However, with this car washer, that’s small stuff to sweat about since it dislodges the toughest elements and enfolds them so that they are all washed away once you rinse or wipe. The result is a spotless, streak-free shine. A characteristic of its brand name, Armor All is a protective car cleaning formula that is safe for all your vehicle finishes, including the clear coat. The 2nd-stage clear coat protects the color coat from the various harmful pollutants, dirt, tree sap, bird droppings, pollen grains, and so on. If it gets eroded, then the color coat and eventually the automobile material is exposed to these elements. Outsmart the elements of Mother Nature with Turtle Wax car wash and wax that features a smart shield technology to maximize your auto care results. Turtle Wax best car cleaners and waxes are made out of a revolutionary blend of surfactants, lubricating agents, and surface conditioners that give your car the ultimate wash, conditioning, and shine. The finest ingredients are also pH balanced and therefore safe and gentle to the most sensitive automobile finish. The pH balance also helps neutralize environmental pollutants on the paint finish, thus making it easier to remove them. Adding 1 oz. of the auto wash to a gallon of cold water produces a rich and lubricious lather that knocks out and encapsulates abrasive soils and dirt particles. Once you rinse the mash-up off, no further cleaning is needed. The advanced blend of synthetic polymers also prevents the soils and other elements from redepositing on your car paint finish, thus preventing surface scratches and swirl marks. Unlike other vehicle washes and detergents that strip your car wax, Turtle ICE contains special gloss enhancers that leave your motty with that ‘newly waxed’ look. Trusted by drivers for over 40 years, Rain-X is a specialty car cleaner that washes and waxes your car in one swipe. Rain-X car wash and wax is made of a deep cleaning formula that dissolves into the deepest corners and crevices of your vehicle that you miss when you wash with dish soap or other unspectacular car washes. From there, the foam dislodges and suspends dirt, road grime, and fumes for easy cleaning. At the same time, the best cleaner wax for cars contains soft gel Carnauba beads that wax and protect your car’s finish against scratches, swirl, and rough environmental conditions. Its all natural formula is biodegradable and pH neutral. Therefore, it is safe for all vehicle finishes and leaves them with a brilliant shine. 3D pink car wash soap is a best in class vehicle and motorcycle detailing product that is tough on dirt, grime and road film but gentle on your car finish. 3D liquid cleaning soap is made of an innovative formula that combines super-concentrated and thick natural ingredients that only take a dab to provide enough lather for your car. 1 ounce foams a gallon of water and thus you are sure it will last for a couple of months. The best soap for power washer will easily clear away all traces of dirt, grime, and road film, restoring your car’s true color in a single stroke. There are those people who will tell that your muscle machine needs a tough-looking cleanser. But why use a rough car wash that harms your vehicle finish? Your motty deserves the gentlest yet the toughest surface cleanser. The quality automotive soap is a favorite of many high-end car detailers and it thoroughly cleans all kind of vehicles, RVs, UTVs, and motor bikes. You don’t want a car detergent that leaves swirls and spots on your car’s exterior, and your hands dry and cracking. With this in mind, 3D pink has been pH balanced so that it is gentle on your car finish, wax and sealant, soft and tender in your hands. Upon mixture with water, it produces dense and stable suds that clean your vehicle as to confidently impress onlookers. The foam also easily rinses off thus saving you gallons of rinsing water. If you are looking for an auto cleaner that respects the environment and won’t cost your time and water to clean, then the perfect match is G-Clean green car wash.
G-Clean is not a soap, detergent or a petroleum solvent. It is a blend of natural and biodegradable plant oils that aggregate into nanometer-sized micelles which penetrate dirt and break into billions of microscopic particles that repel endlessly each other. This continues until the particles and the cleaners decompose into the ground. It dissolves and repels dirt, whether you are using it in the bucket method, with a washcloth or mitt. It ranks among the best car waterless wash treatment and you only need to soak a microfiber towel in a foam of the cleanser and wipe your car exterior. You then dry the surface with a dry towel or mitt and you are good to go. It is therefore convenient for washing your car on the driveway without the fear of a water runoff. Hydrophobic rinsing action forces beading up of water molecules that roll off your car surface for fast drying and leaving a spot-free shine. The natural and biodegradable ingredients are entirely harmless to the environment. Thus it allows you to live life to the fullest and still leave a better world for your children. If you love your car, you definitely not only want it to end up clean when you wash it, but shiny and radiant as well. If it was just about cleaning, then you could have simply splashed water and let it dry. With that being the case, you should go for a cleaner that will be tough on dirt but handle your car like a baby. It should also be gentle on you, your pocket and Mother Nature. So what do you look out for? The ingredients should erupt into a long-lasting foam once mixed with water to the recommended dilution. This will enable the suds to grab and suspend dirt and grime from the vehicle surface and crevices, without the need of you scrubbing it off. Incessant scrubbing would scratch the paint and glass. An acidic car shampoo or soap will gradually corrode the wax, clear coat, rubber seals and all, leaving your car looking old just because you wash it. On the other hand, a pH neutral cleanser will neutralize the environmental pollutants and won’t eat away your car finish. Besides, it won’t leave your hands dry and scaly. You borrow the world from your kids and the best interest you can pay is to use compounds that decompose and disintegrate as soon as they hit the ground. Plant oils such as citrus have proved to be as effective as synthetic polymers and yet they won’t take centuries to disintegrate. The more concentrated the soap formula is, the less you will use per cleaning session and if the price is comparable to other washes, then it is better for your pocket since it will last longer. There are car cleaners that are made of rich surfactants and polymers such that you only need to wipe your car with a wet cloth and they’ll grab the dirt and grime. This conserves water and you don’t have to end up with a swampy driveway. However, they are most effective for light touch-ups and they are not good at washing off mud, heavy grime and grease. For the heavy dirt, you may need to pressure wash and then rinse. A marketer cannot speak ill of his product and therefore it is important to go through the end user reviews on Amazon and learn about their experience. It is also important to check the statistics- total number of reviews and the average score. A high number of positive reviews are definitely an indicator that you are missing out. One of the ironies of our modern times is that ignorant cleaning of your car may actually damage the car material and finish. If you use the wrong cleanser or the wrong method, then you may end up with a jalopy of a car with ugly swirl marks, spots, eroded wax, and sealants. But once you are armed with the right information, you can wash your car with the confidence that what you are doing will keep it radiant for the long haul. You might be wondering what can i wash my car with? Just like any other cleaning process, there are some items that you can’t do without when you want to clean your car exterior. The best soap to wash your car paint should be gentle both in pH and beading of ingredients in order not to grind the wax and paint. However, you will need a tougher wash that will clear grease, tar and road grime from the wheel and tires. If you prefer a faster wash and rinse method, or the car is extremely muddy, then you need to get a pressure washer or a foam gun. A foam gun is fitted with foam cannon and works with your typical garden hose as long as they can fit. A pressure washer can pump a thicker spray that will stay on your car for longer compared to the thin foam gun spray. The wheels bear the highest dirt, grease and mud and there is no need of hurting your hand struggling to clean all that from the spokes with a sponge or towel. What you need is a car wheel brush to scrub the spokes, inside the fender and the tire treads. If you are not using a waterless car wash soap, then you will need water from a garden hose for rinsing. The hose should have a spray nozzle to adjust the pressure and also conserve water. Step 1; Make sure that your car is cool and in a shade if it’s sunny. If you were driving, let the car to cool down since the hot surface will evaporate the soap faster than you wipe it, leaving swirls and spots. Step 2; Gently rinse the car from the garden hose to remove loose dirt and mud. It also soaks the tough dirt and grime so that it is easily lifted by the cleaner without scratching the paint. Step 3; Pour the wash concentrate into one bucket or foam cannon, and dilute with water to the recommended ratio. Fill the second bucket with clean water. Step 4; Wet the sponge, terry cloth or mitt in the soapy solution and start by cleaning the car from top to bottom. The lower parts are always dirtier and it’s, therefore, better to let the dirt run downwards. As you clean, use straight hand strokes and not circular motions. Circular patterns can create unwelcome water swirls. If using a pressure washer, adjust it to low pressure since a strong jet can rip the paint. Step 5; After you have a washed a section with the soapy water, rinse the mitt or towel in the clean water and wipe that section before the soap dries off. Letting any section to dry before rinsing will make it difficult to wipe and result in ugly spots. Step 6; Once you have cleaned all sections, rinse the car with the spray hose or power washer, again from top to bottom and ensure all soap has been removed. Step 7; Dry the vehicle using a scratch-free microfiber towel or chamois. The best way to dry car after washing is to start with the windows since the dry towel fibers won’t scratch it.